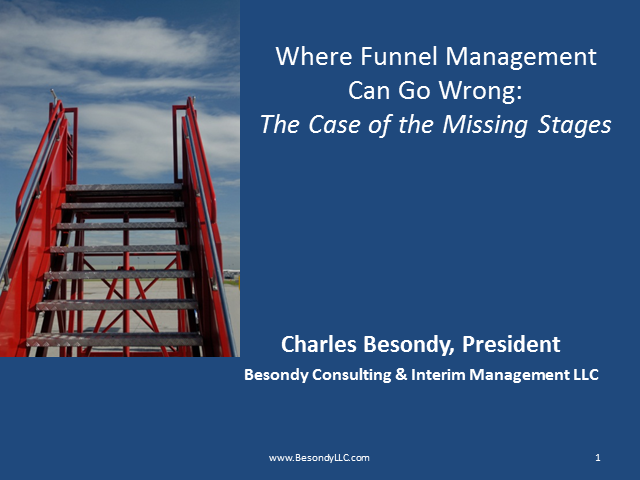 Your company believes it has a sales funnel management process, right? Opportunities are tracked through a set of stages, probably in a CRM program. You’re most likely tracking some basic metrics like leads to opportunities, proposals to close, etc. All of that is good and perfectly well-suited for a B2B company of the 1980s, but not if your company wants to accelerate its revenue growth today. Buyers buy differently today and if your funnel doesn’t reflect how buyers buy, you’re probably falling behind your competitors. Indeed, the funnel management of many companies only covers about half of the actual stages through which a typical B2B buyer progresses. If you’re not properly managing the entire funnel a high percentage of potential deals are going to your competitors without your company even getting a chance at bat.